The production of made-to-measure footwear is the crowning discipline of the shoemaking trade. Customised shoes are becoming increasingly popular for foot health reasons and because of their long product lifetime and the recyclability of the materials used. There is also a significant demand from theatre, film and carnival performers. Nevertheless, the main focus of business within this area continues to be on repairs. Working on behalf of the Federal Government and acting in conjunction with the federal ministries responsible, the social partners and experts from the field of company practice, the Federal Institute for Vocational Education and Training (BIBB) has updated the existing training in the occupation of shoemaker and introduced the new title of “custom shoemaker”. This fresh designation emphasises the individual and hand-made manufacturing process and thus underlines the difference to industrial mass production. The new regulation enters into force on 1 August 2018. 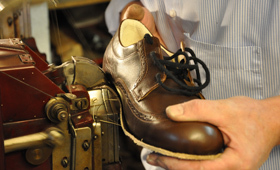 The updating of the three-year programme of training in the occupation of shoemaker addresses the technical, economic and organisational changes and developments that have taken place at companies operating in the shoemaking trade. Contents relating to areas such as model design, quality assurance, sustainability, customer orientation and presentation and sale of services, goods and products have been accorded greater significance or in some cases have been included for the first time. Individual adaptation of ready-made shoes, a task which allows custom shoemakers to expand their performance profile, is another new aspect. Companies which specialise in the production of uppers will also be able to provide training in accordance with the new regulation in future. For this reason, the two specialisms of “custom shoes” and “upper construction” have been established as elements for the third year of training. The first two years of training will mainly focus on the repair and alteration of customised and ready-made shoes before trainees opt for one of the two specialisms in their final year. The specialism of “custom shoes” continues to develop the training contents of the previous occupational profile. It enables trainees to gain detailed experience of the production of made-to-measure shoes using different techniques. The newly created specialism of “upper construction” focuses on the manufacture of uppers, which are supplied to producers of customised footwear in the form of prefabricated components. The upper is of particular importance because of its visibility as part of the shoe. Aspects such as material combinations, decorative stitching, hole punchings and fastenings can be designed in many different ways and need to be finished with extreme accuracy. Employment prospects for trainees and skilled workers are good, and self-employment is a popular subsequent route. After completion of the journeyman examination, possible pathways include continuing training leading to the qualification of master shoemaker or technician training in the specialism of shoe technology. There are currently around 2,350 registered master shoe makers running their own firms and about 850 other companies offering repair services. The updated training regulations and the aligned skeleton curriculum, which has been developed by the Standing Conference of the Ministers of Education and Cultural Affairs (KMK) for the school-based section of the dual vocational education and training, replaces the existing regulations from 2004 as of 1 August 2018. Picture material is available at www.bibb.de/pressefotos.